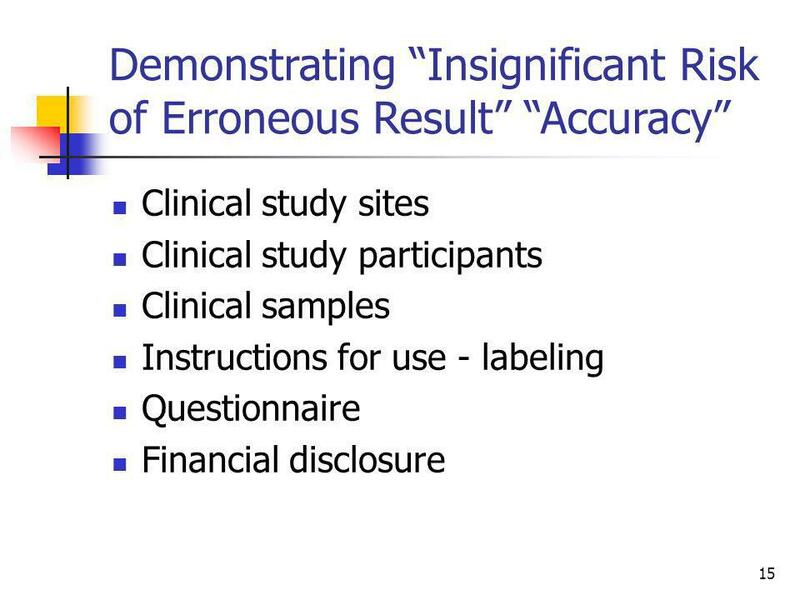 The term “accurate” tests refers to those tests that are comparable to traceable methods. 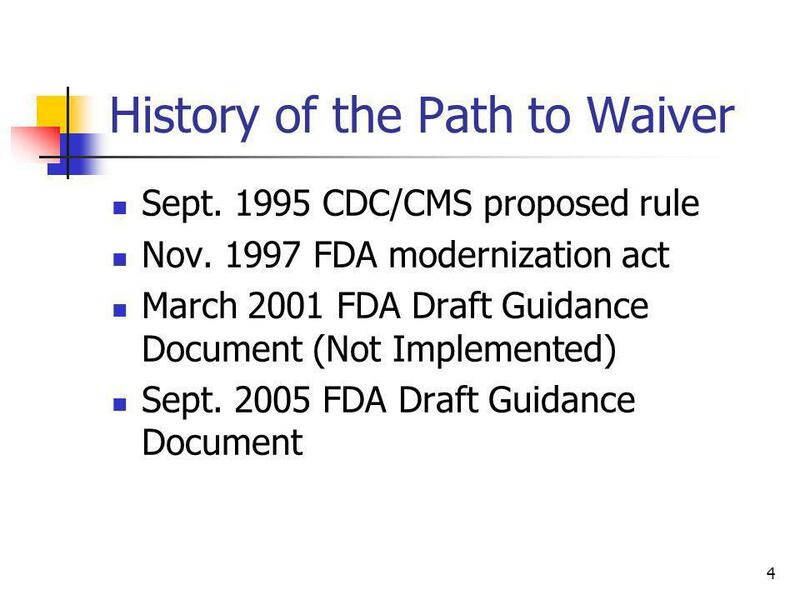 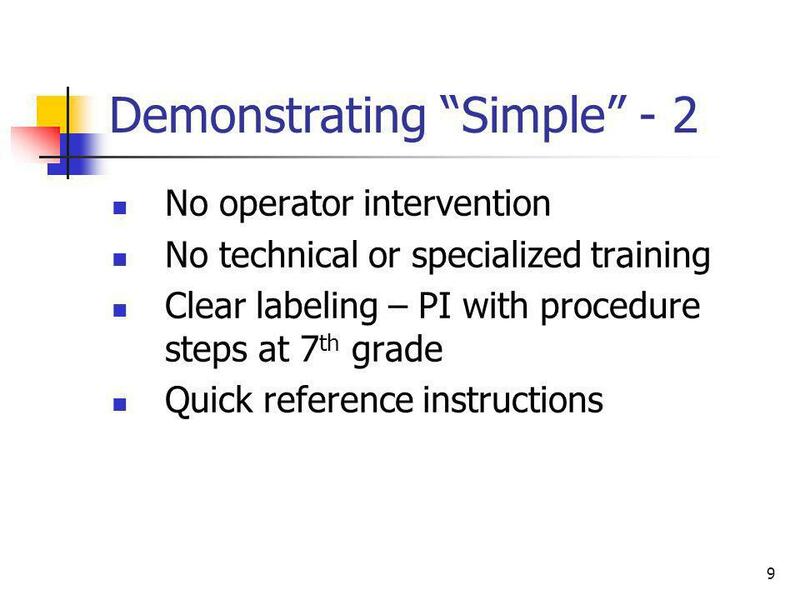 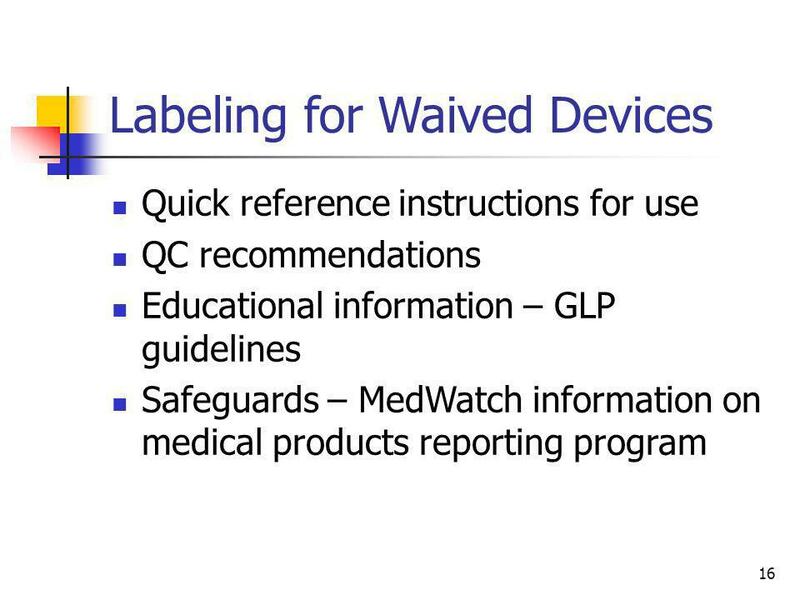 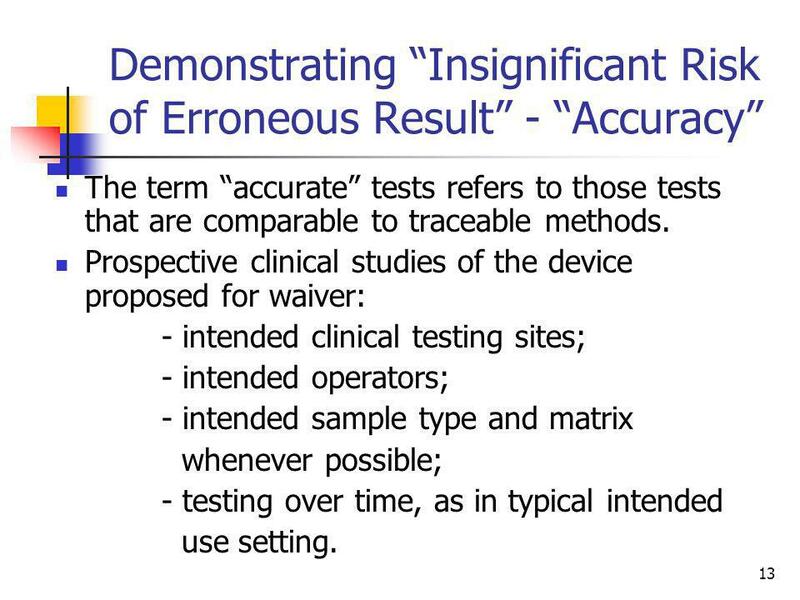 Prospective clinical studies of the device proposed for waiver: - intended clinical testing sites; - intended operators; - intended sample type and matrix whenever possible; - testing over time, as in typical intended use setting. 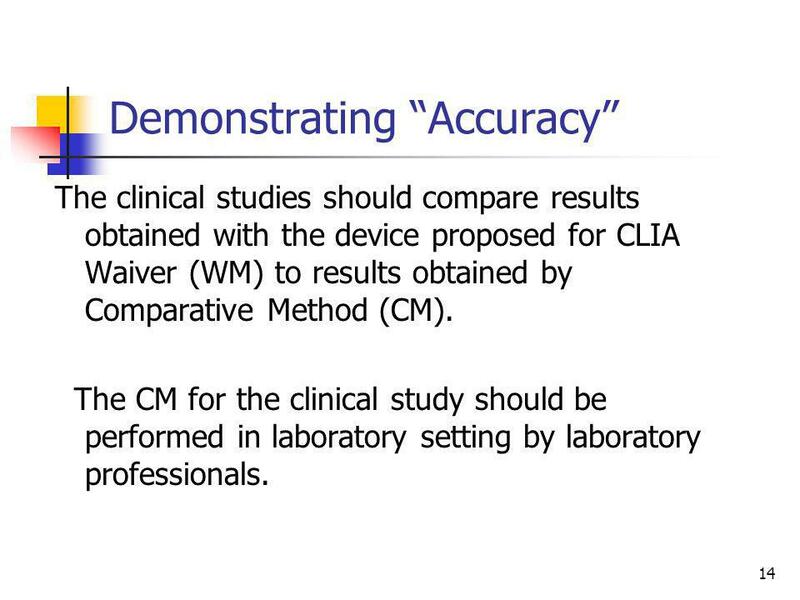 The clinical studies should compare results obtained with the device proposed for CLIA Waiver (WM) to results obtained by Comparative Method (CM). 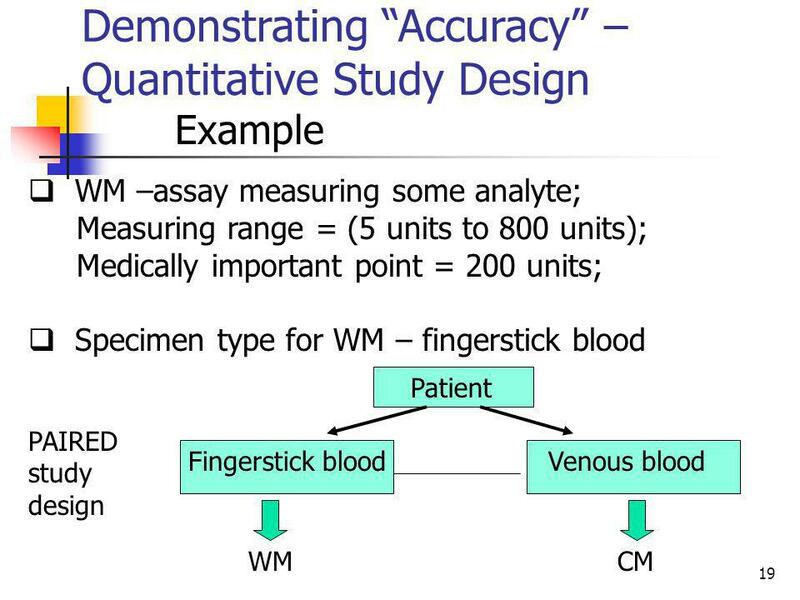 The CM for the clinical study should be performed in laboratory setting by laboratory professionals. 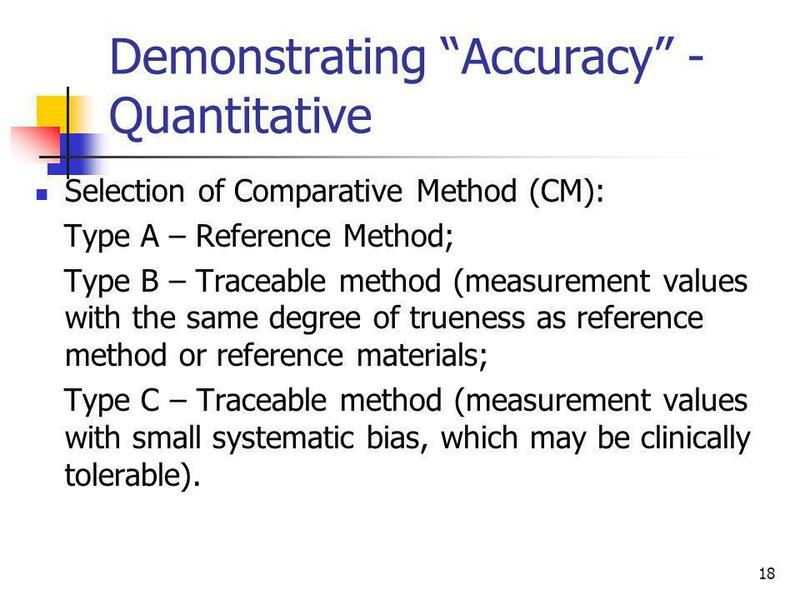 Selection of Comparative Method (CM): Type A – Reference Method; Type B – Traceable method (measurement values with the same degree of trueness as reference method or reference materials; Type C – Traceable method (measurement values with small systematic bias, which may be clinically tolerable). 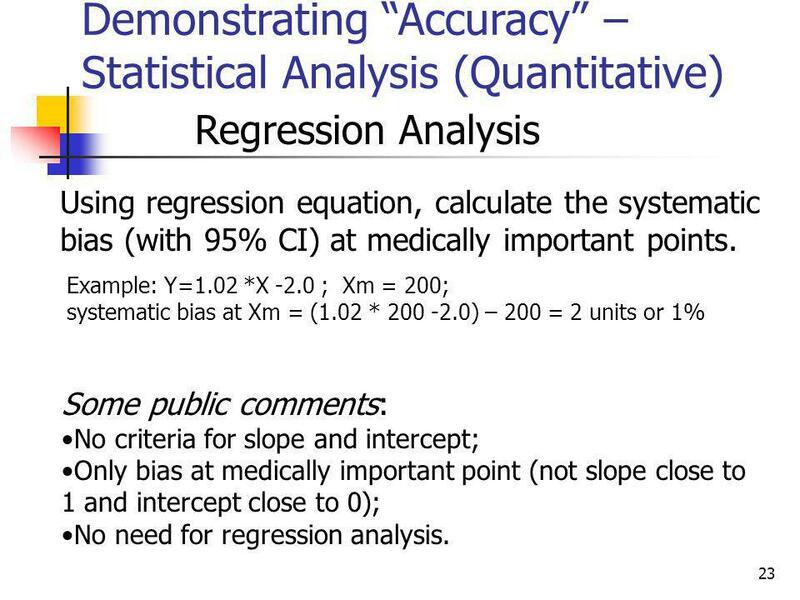 Regression Analysis Using regression equation, calculate the systematic bias (with 95% CI) at medically important points. 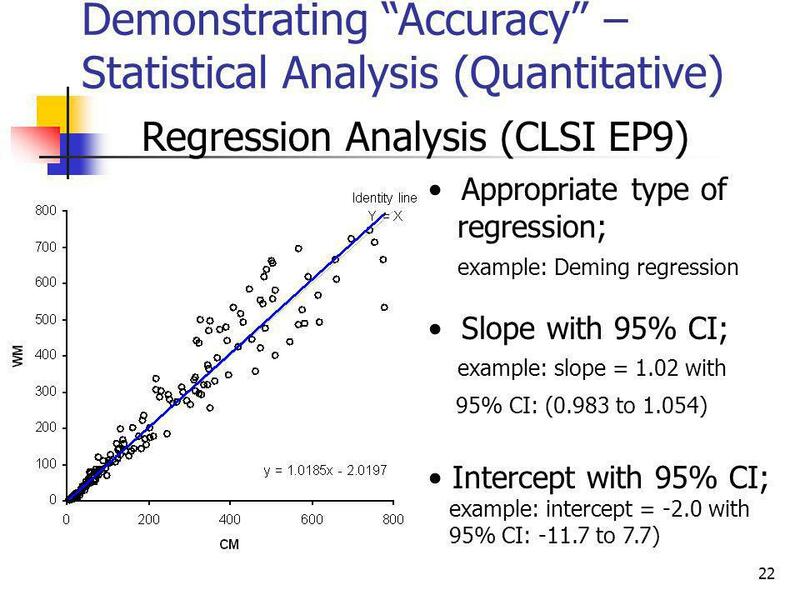 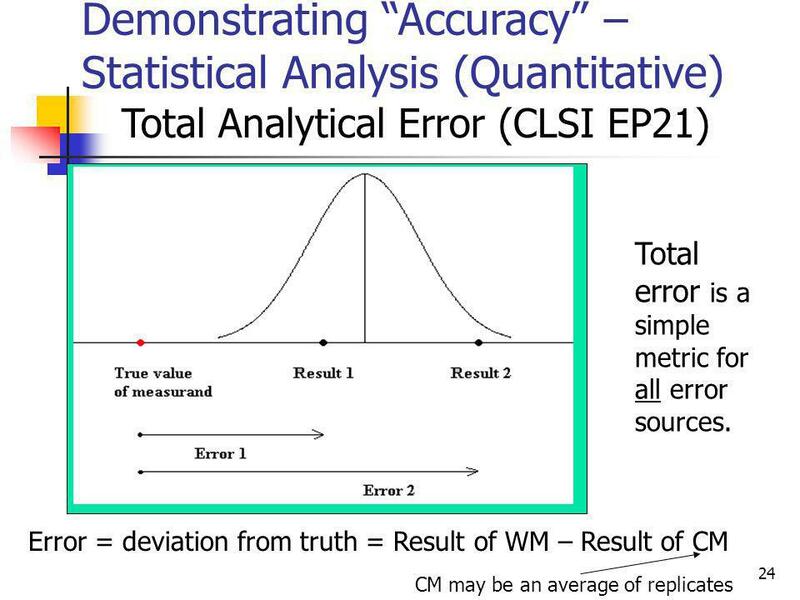 Example: Y=1.02 *X -2.0 ; Xm = 200; systematic bias at Xm = (1.02 * ) – 200 = 2 units or 1% Some public comments: No criteria for slope and intercept; Only bias at medically important point (not slope close to 1 and intercept close to 0); No need for regression analysis. 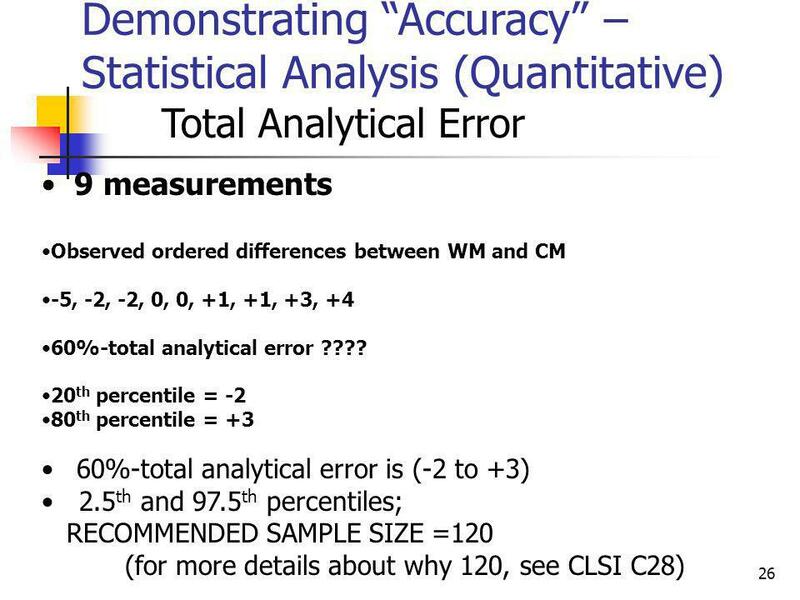 Total Analytical Error Divide the measuring range for three medically relevant intervals; For each interval calculate the total analytical error. 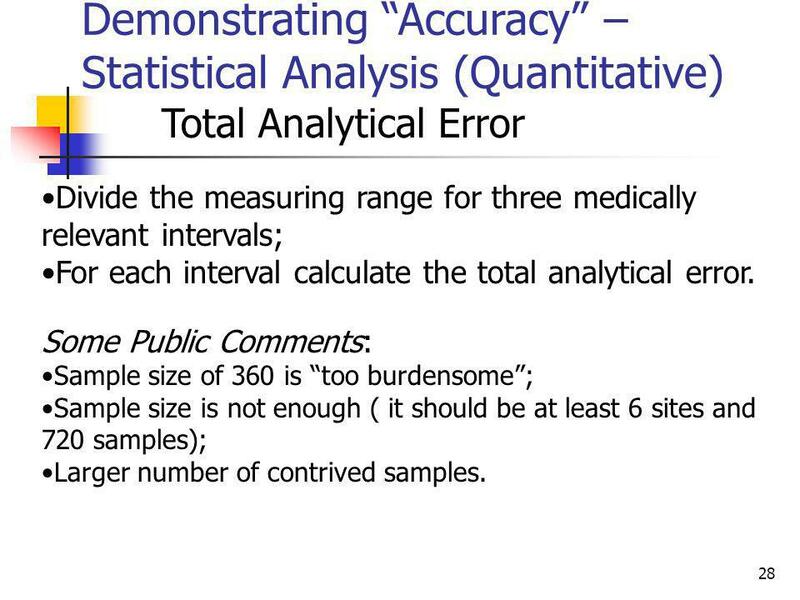 Some Public Comments: Sample size of 360 is “too burdensome”; Sample size is not enough ( it should be at least 6 sites and 720 samples); Larger number of contrived samples. 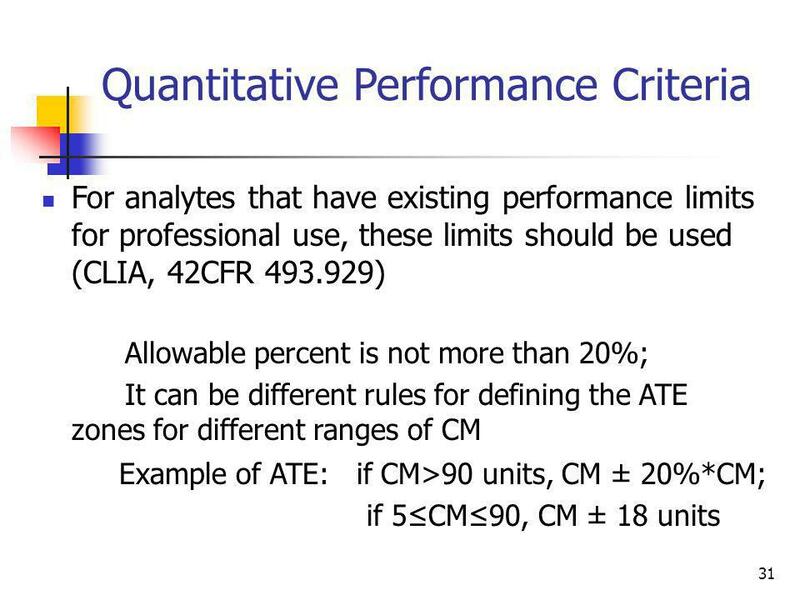 Establish Allowable Total Error (ATE) (for 95% of differences for WM and CM): values of WM that fall within ATE zones are values that can be tolerated without invalidating the medical usefulness of the WM results. 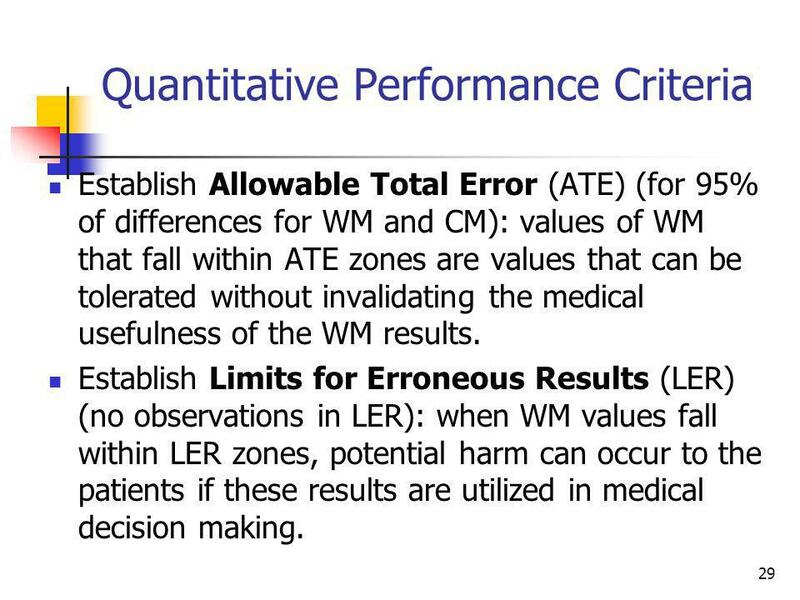 Establish Limits for Erroneous Results (LER) (no observations in LER): when WM values fall within LER zones, potential harm can occur to the patients if these results are utilized in medical decision making. 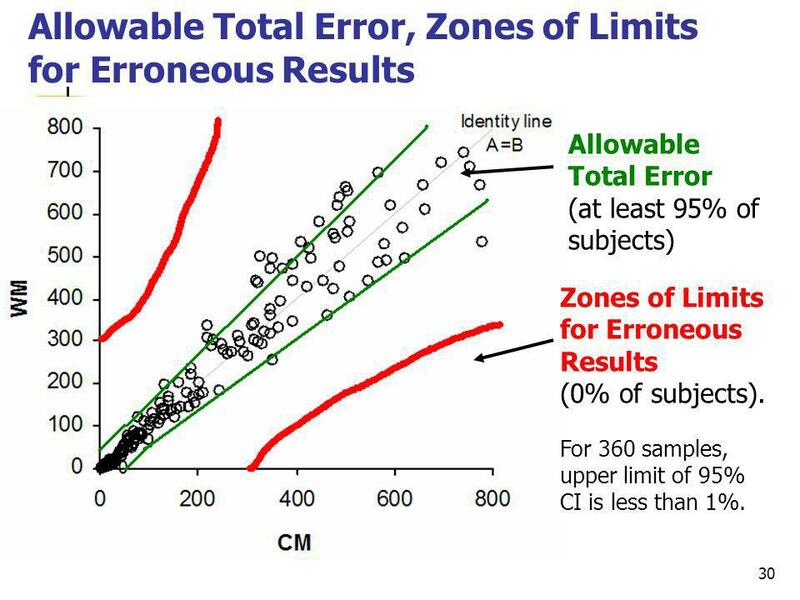 (at least 95% of subjects) Zones of Limits for Erroneous Results (0% of subjects). 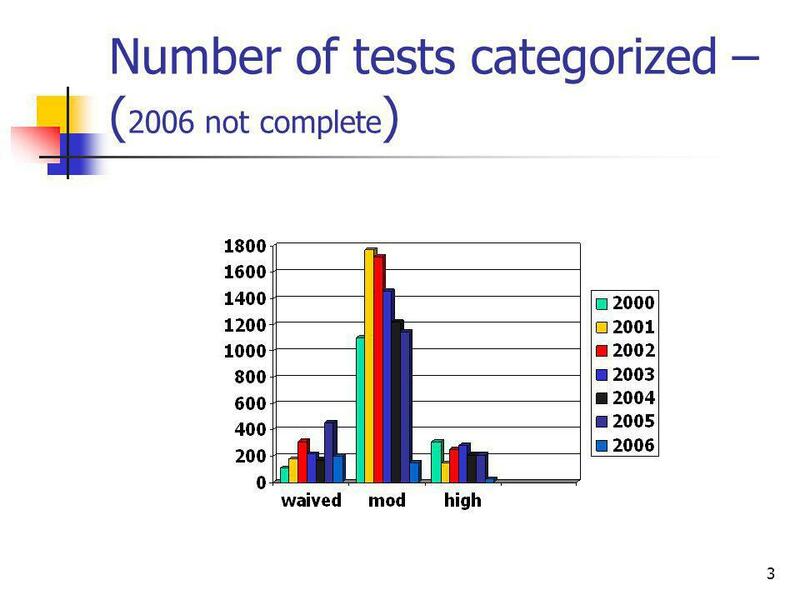 For 360 samples, upper limit of 95% CI is less than 1%. 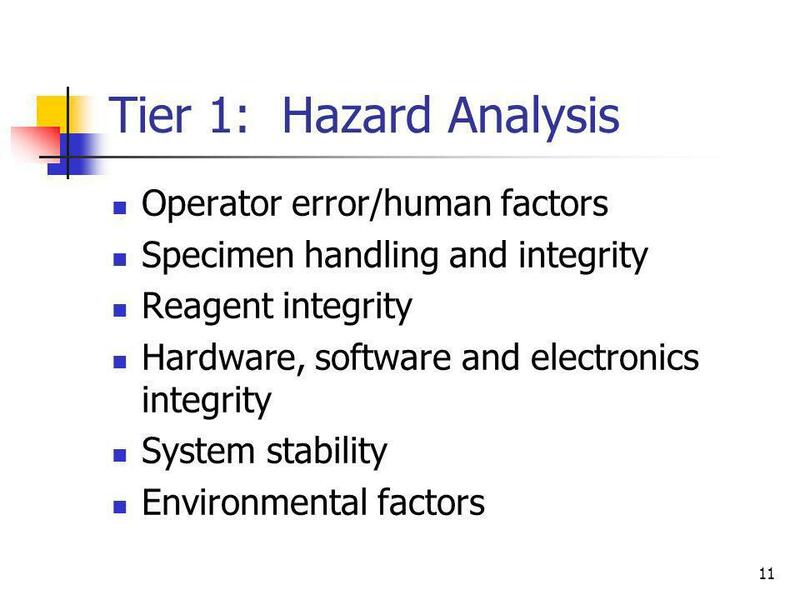 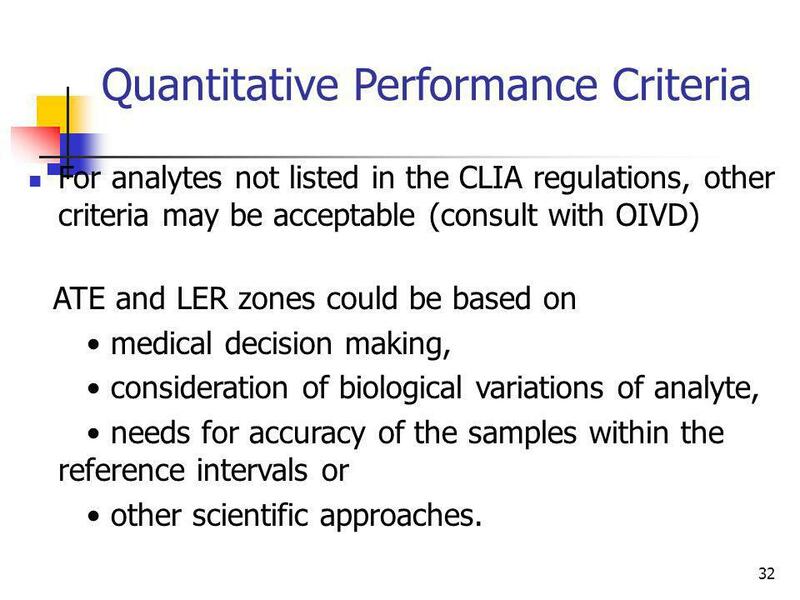 For analytes not listed in the CLIA regulations, other criteria may be acceptable (consult with OIVD) ATE and LER zones could be based on • medical decision making, • consideration of biological variations of analyte, • needs for accuracy of the samples within the reference intervals or • other scientific approaches. 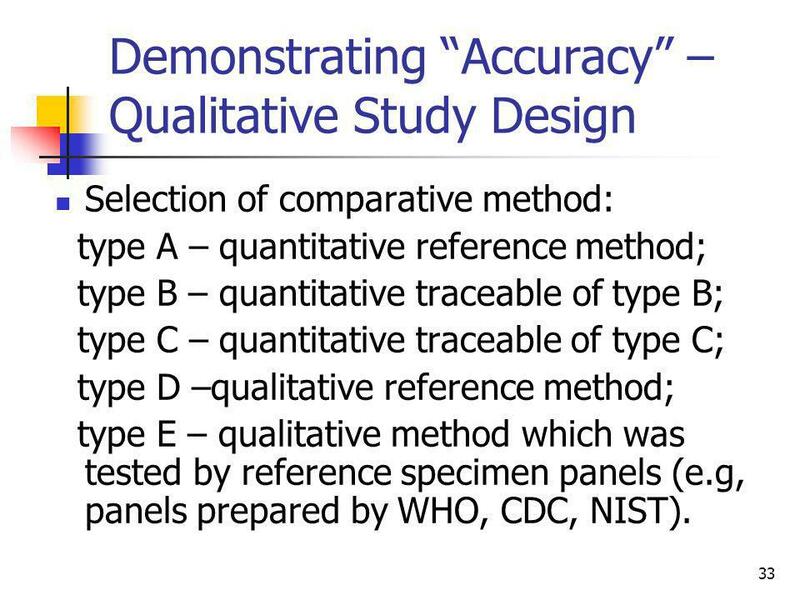 Selection of comparative method: type A – quantitative reference method; type B – quantitative traceable of type B; type C – quantitative traceable of type C; type D –qualitative reference method; type E – qualitative method which was tested by reference specimen panels (e.g, panels prepared by WHO, CDC, NIST). 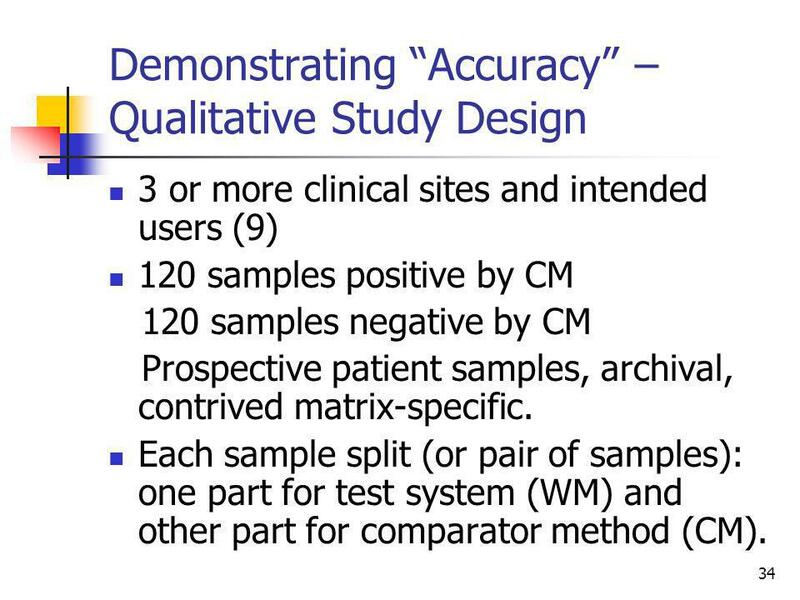 3 or more clinical sites and intended users (9) 120 samples positive by CM 120 samples negative by CM Prospective patient samples, archival, contrived matrix-specific. 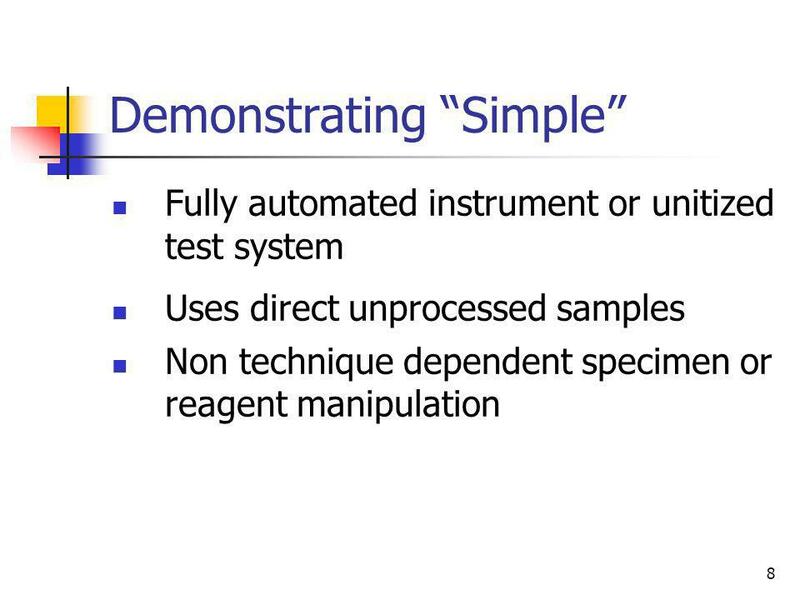 Each sample split (or pair of samples): one part for test system (WM) and other part for comparator method (CM). 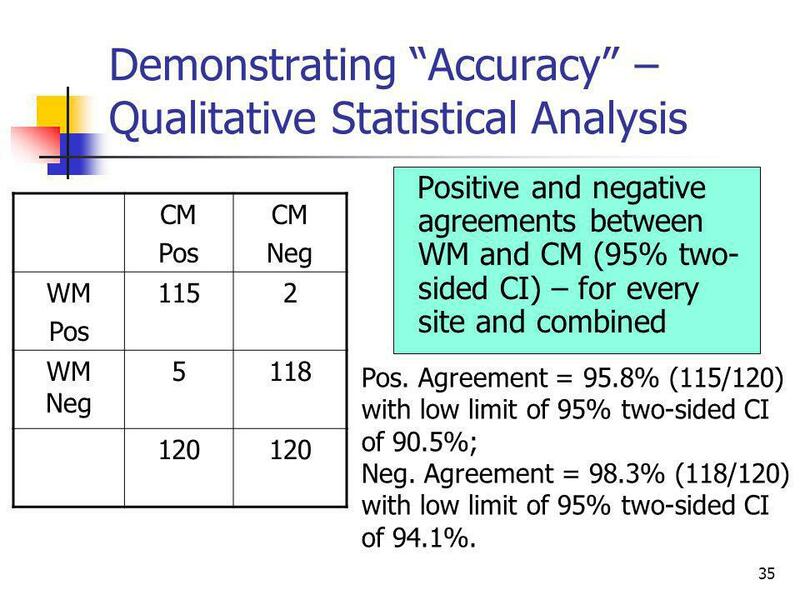 Positive and negative agreements between WM and CM (95% two-sided CI) – for every site and combined CM Pos Neg WM 115 2 WM Neg 5 118 120 Pos. 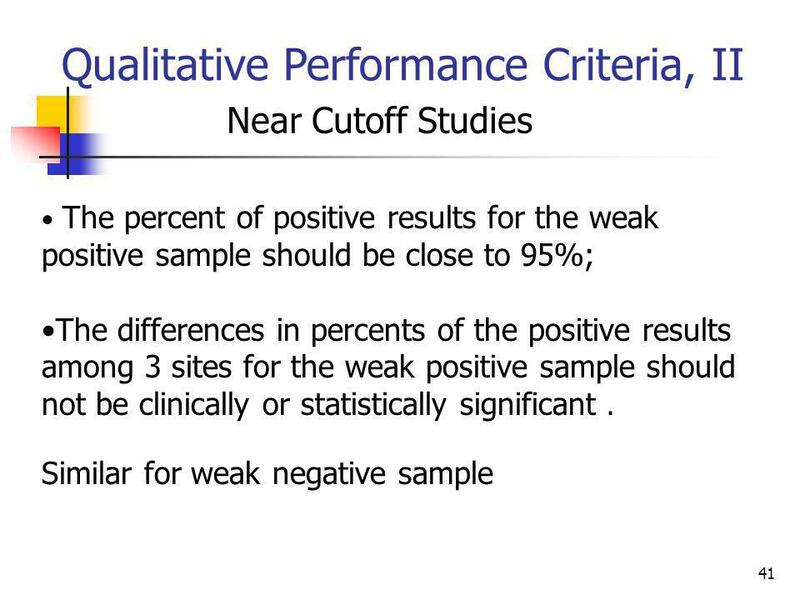 Agreement = 95.8% (115/120) with low limit of 95% two-sided CI of 90.5%; Neg. 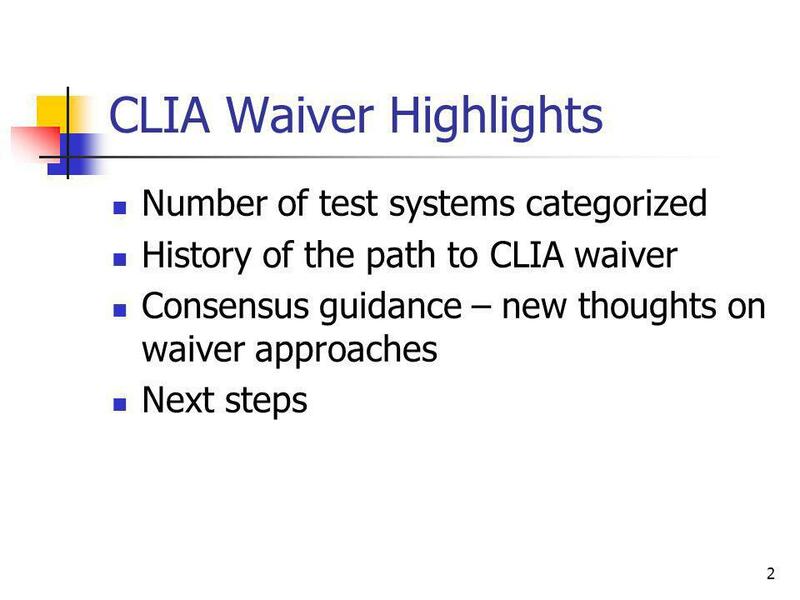 Agreement = 98.3% (118/120) with low limit of 95% two-sided CI of 94.1%. 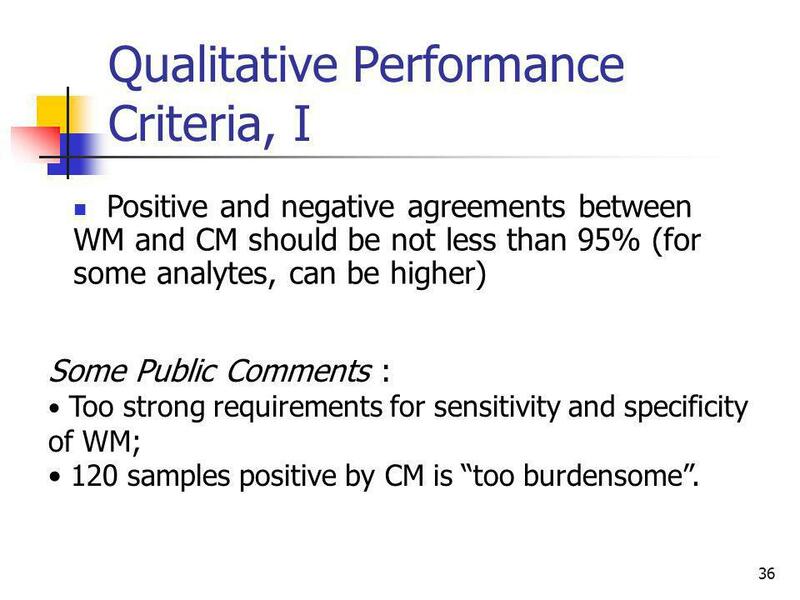 Positive and negative agreements between WM and CM should be not less than 95% (for some analytes, can be higher) Some Public Comments : Too strong requirements for sensitivity and specificity of WM; 120 samples positive by CM is “too burdensome”. 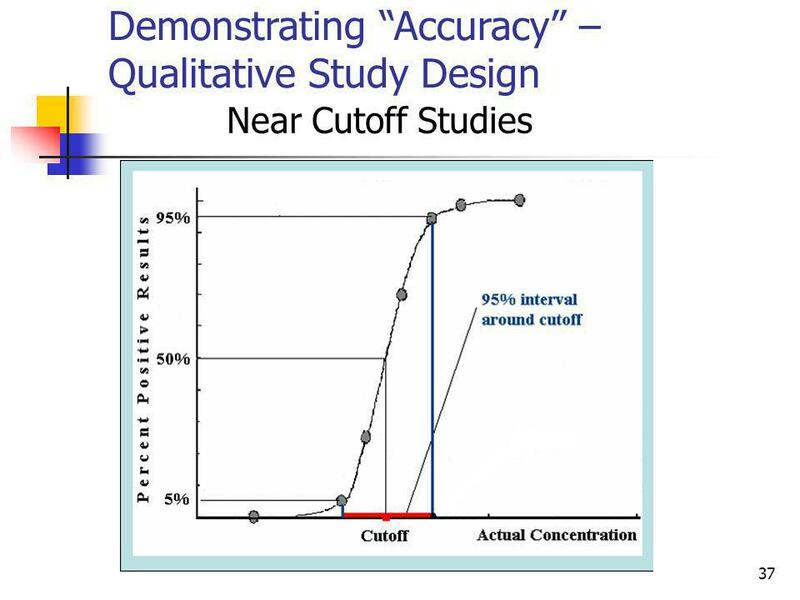 Near Cutoff Studies Weak Positive concentration is a concentration above the cutoff that the test yields positive results 95% of the time. 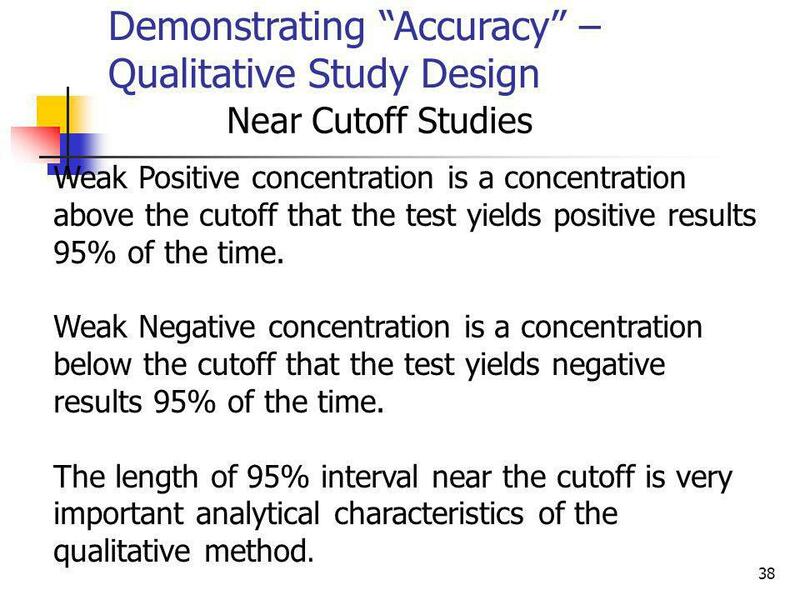 Weak Negative concentration is a concentration below the cutoff that the test yields negative results 95% of the time. 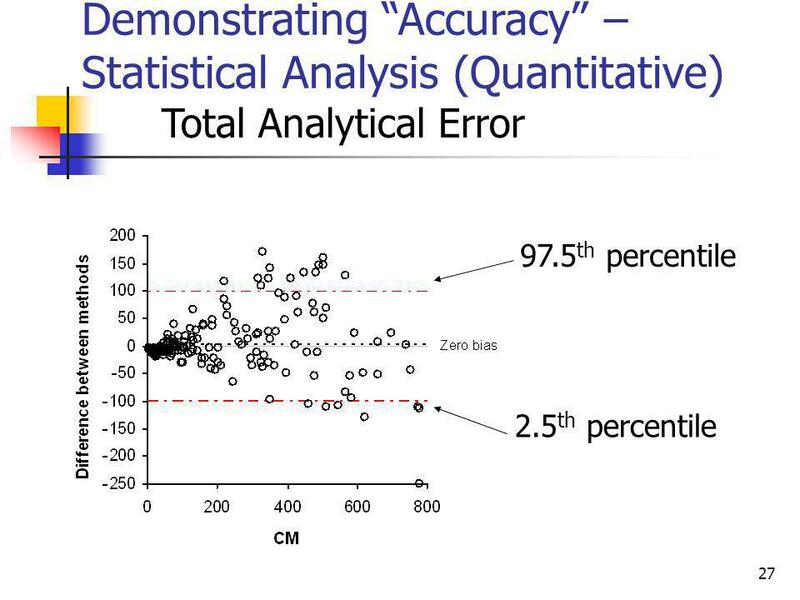 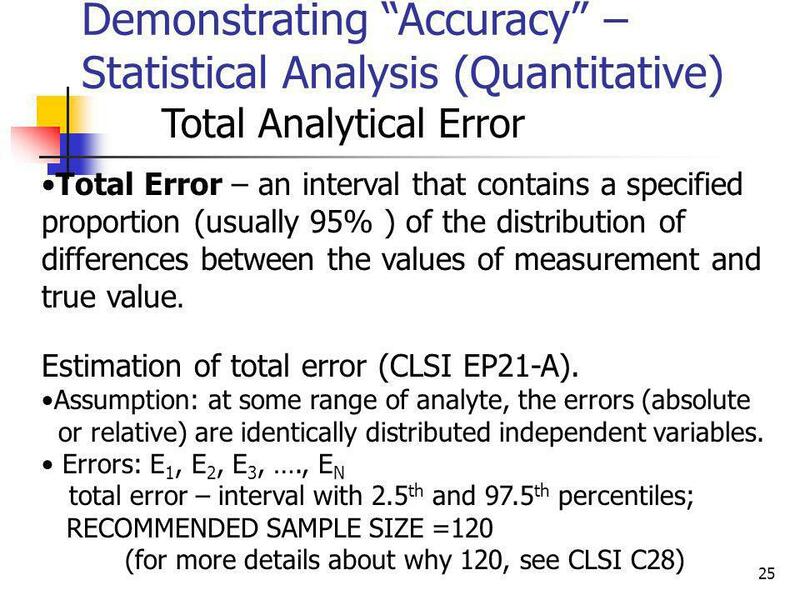 The length of 95% interval near the cutoff is very important analytical characteristics of the qualitative method. 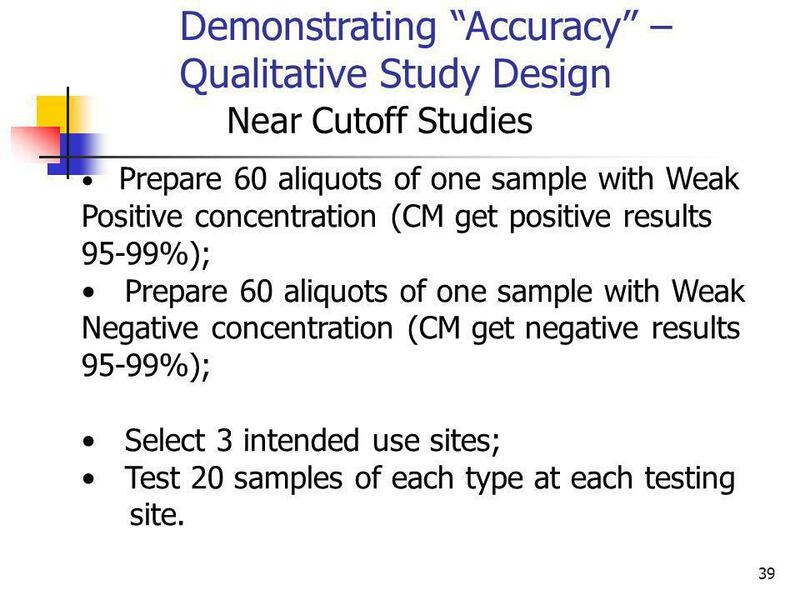 Near Cutoff Studies Prepare 60 aliquots of one sample with Weak Positive concentration (CM get positive results 95-99%); Prepare 60 aliquots of one sample with Weak Negative concentration (CM get negative results 95-99%); Select 3 intended use sites; Test 20 samples of each type at each testing site. 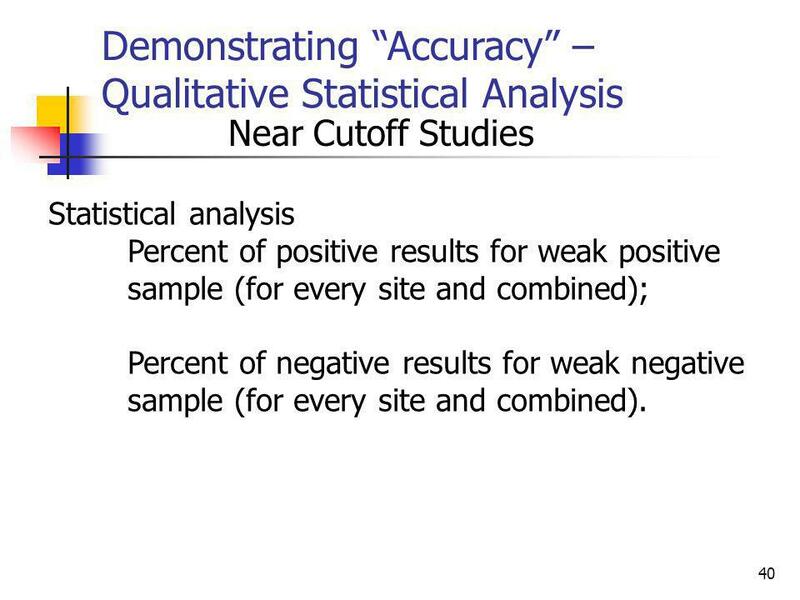 Near Cutoff Studies Statistical analysis Percent of positive results for weak positive sample (for every site and combined); Percent of negative results for weak negative sample (for every site and combined). 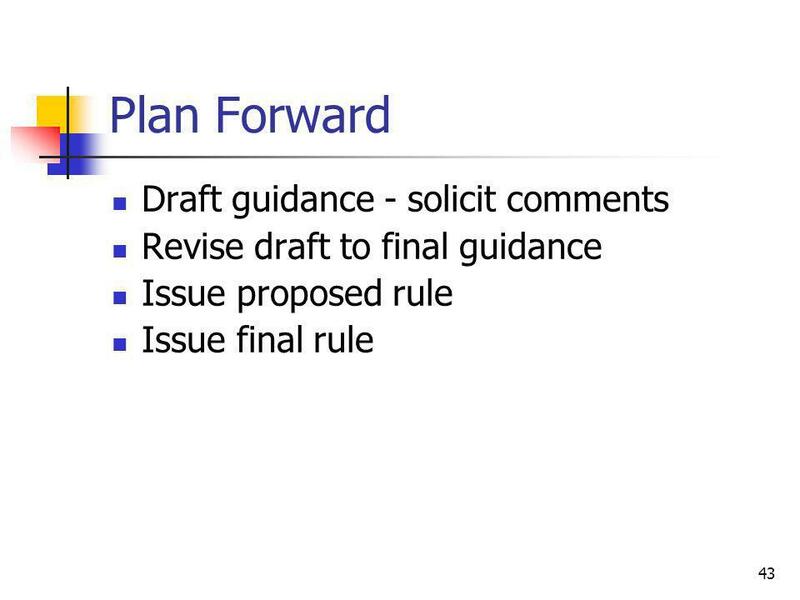 “…This is a tremendous guideline. 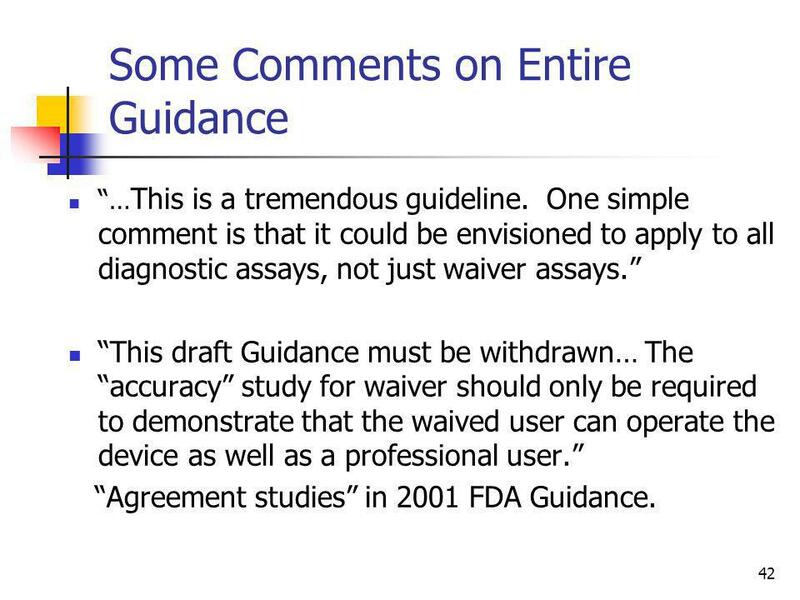 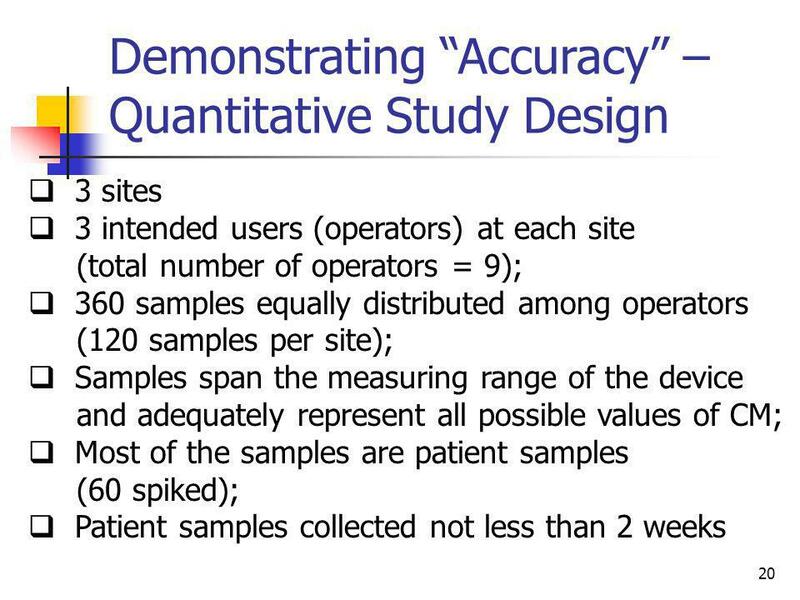 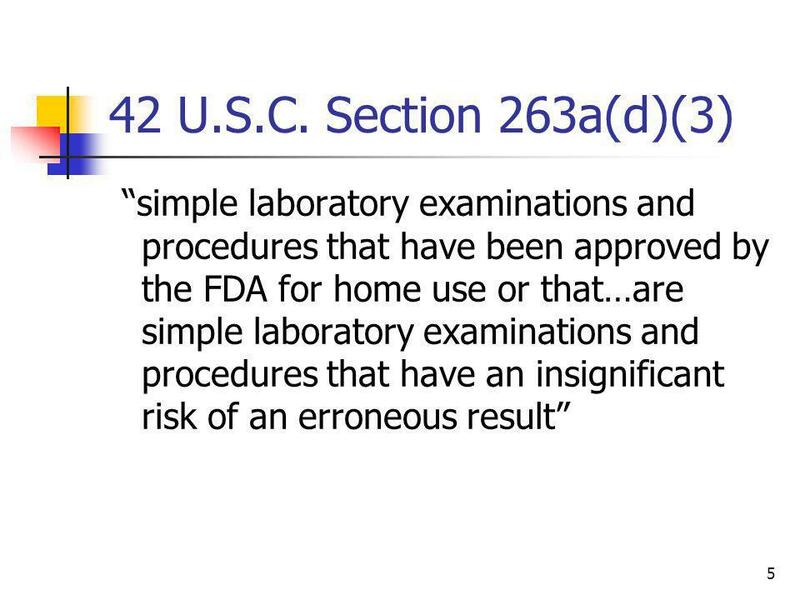 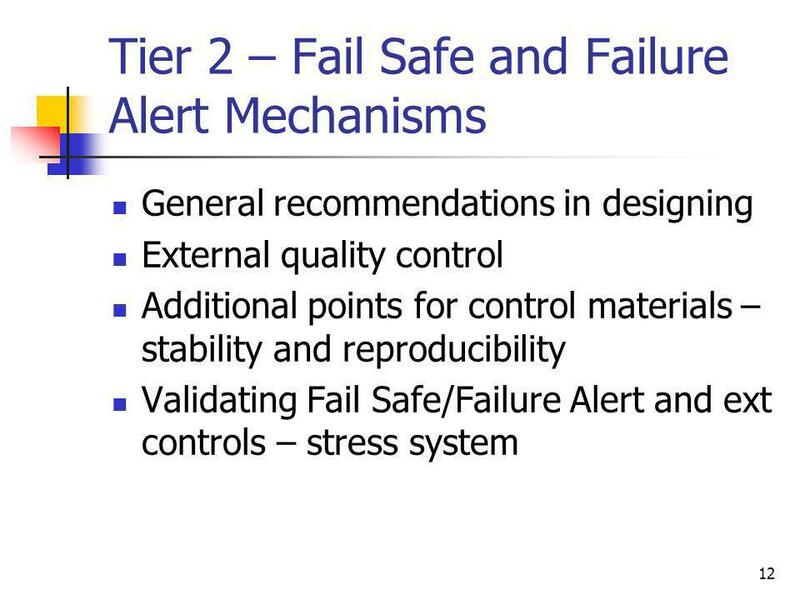 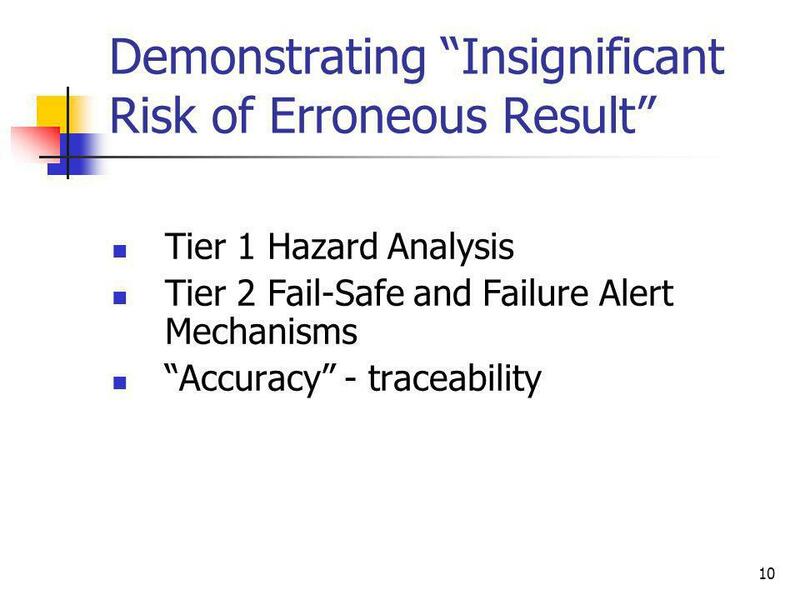 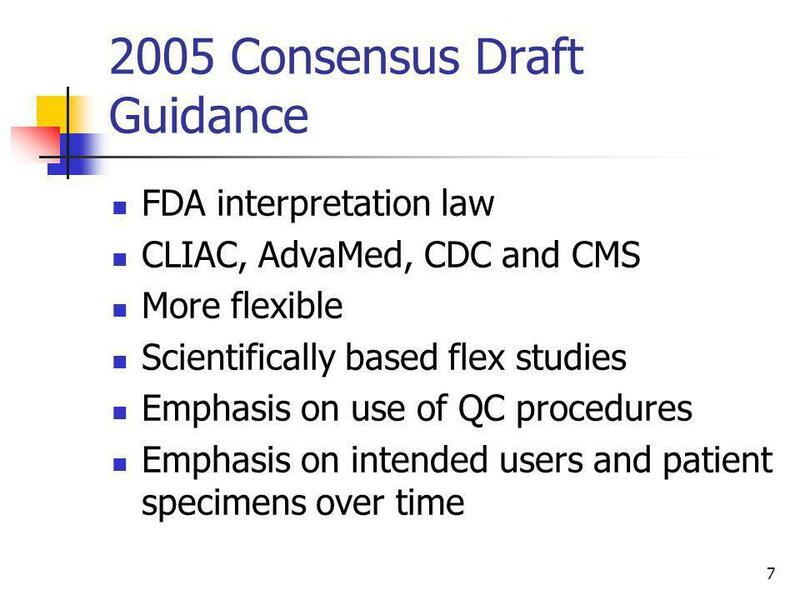 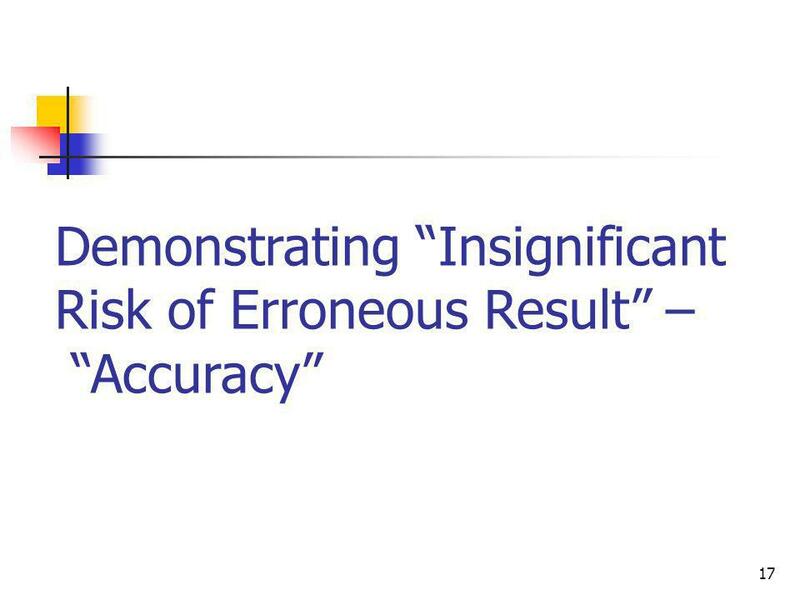 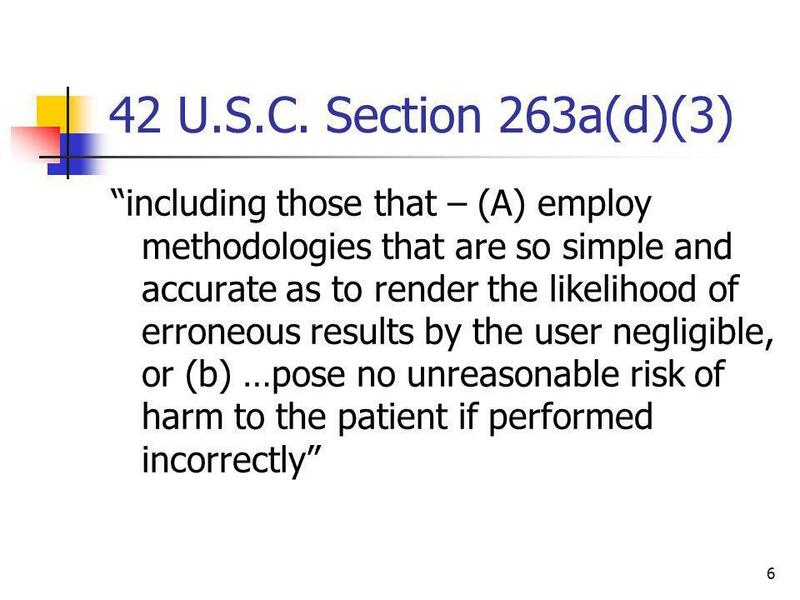 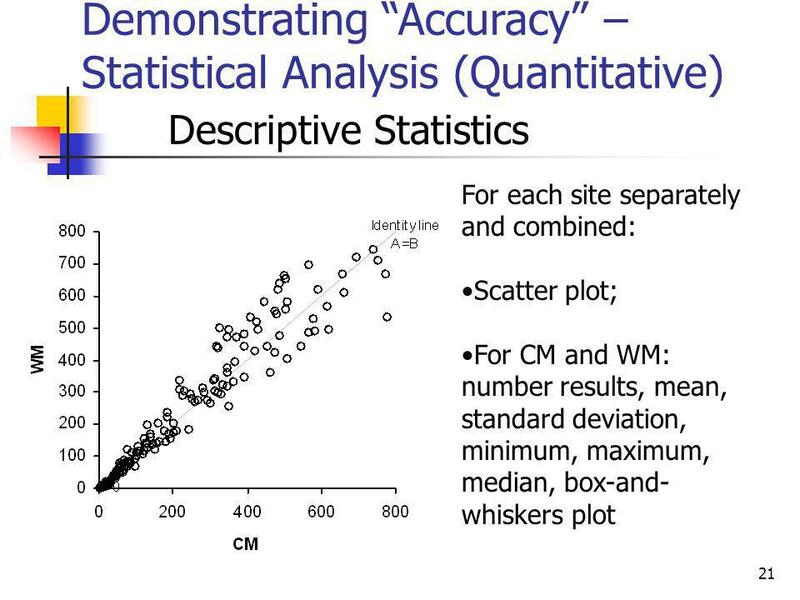 One simple comment is that it could be envisioned to apply to all diagnostic assays, not just waiver assays.” “This draft Guidance must be withdrawn… The “accuracy” study for waiver should only be required to demonstrate that the waived user can operate the device as well as a professional user.” “Agreement studies” in 2001 FDA Guidance. 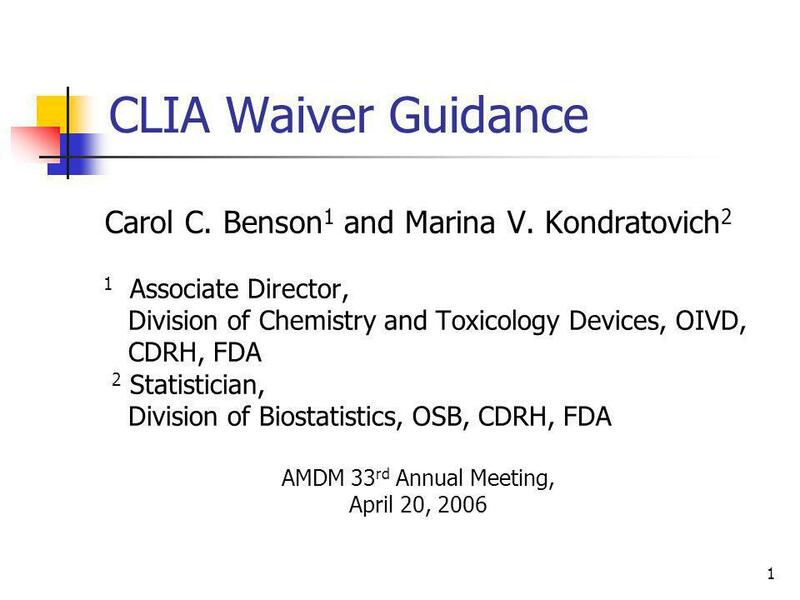 Download ppt "Carol C. Benson1 and Marina V. Kondratovich2"